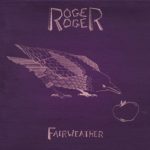 Roger Roger; just to clear up any confusion it’s not a call-sign, it’s Lucas and Madeleine Roger, two twins from Winnipeg and their debut album, “Fairweather” is co-produced by their father Lloyd Peterson. Glad we got that cleared up. Each of the siblings brings their individual flavour to the album and the songs are split almost evenly between them. Madeleine’s songs are in the classic introspective, story-telling style, while Lucas brings a guitar-slinging slacker feel to the album with his contributions. Each takes lead vocal on their own songs and adds harmonies as the final ingredient on their sibling’s songs; the final confection is very tasty indeed. “Fairweather” is a very clean-sounding album that doesn’t need too many production tricks to enhance the nine songs or Lucas and Madeleine’s vocal and instrumental performances. The album as a whole evokes the seventies Laurel Canyon singer/songwriter era (and Madeleine can sound a lot like Joni Mitchell), but there are hints of later styles, particularly in “Another Girl’s Shoes” which has the melancholy feel of The Gin Blossoms or Matchbox Twenty. The biggest production on the album is “Mad Trapper”, which combines an early Eagles feel with an over-driven guitar riff, Hammond and some nice harmonies. The album’s opener, “13 Crows” is the moving story of an old man’s reminiscences as he nears the end of his life, set against a chiming guitar riff that has more than a passing resemblance to the main theme from Beethoven’s Ninth. It’s catchy and thought-provoking, setting the tone for the rest of the album. The clean production and the two superb voices tie in the album’s disparate elements, such as the contrasting songwriting styles and arrangements, creating an album that’s mellifluous and intelligent. If you want recommendations, the title song is a lovely, melancholy picture of a person whose life revolves around missing opportunities, while the closing song, “Scott Free” tells the tale of a woman in a doomed relationship with a bad boy. “Fairweather” is a lovely album packed with catchy melodies woven round stories of smalltown characters and misfits. “Fairweather” is out in the UK on Friday October 7th.